Acco Louden Model 551 and 552 single girder hand propelled cranes. 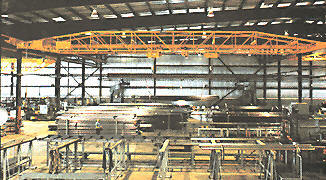 The model 551 crane offers capacities of 1/2 and 1 ton with spans up to 20 feet. The Acco Louden model 552 crane is available in capacities of 1/2 through 2 tons to operate on 2" flange runways, and capacities 1/2 through 3 tons to operate on 3.33" flange runways, with spans up to 50. Acco Louden Model 585 motor propelled dual drive cranes. The Louden® series 585 crane is a single girder, steel wheel dual drive crane which operates on runways with 3.33" flange. This dual drive crane is offered in capacities of 1 through 5 tons, with spans up to 50'. Acco Louden Model 503 single girder motor propelled center drive cranes. The Louden® series 503 crane is a single girder motor propelled crane with center drive and outrigger bracing which operates on 3.33" flange runways. This center drive crane is offered in capacities of 1 through 5 tons, with spans up to 58 feet. Also available is the model 503T which is offered in capacities of 5 through 10 tons, with spans up to 60 feet. This crane also operates on 3.33" TrojanTrack® runways. Acco Louden Model 586 motor propelled dual drive cranes. The Louden® 586 crane is a steel wheel, multiple drive, double girder, motor propelled crane which operates on runways with a 3.33" flange. This crane is offered in capacities of 1 through 10 tons with spans up to 56 feet. Acco Louden Model 517 and 517T double girder motor propelled center drive cranes. The Louden® series 517 crane is a double girder, motor propelled crane with center drive, to operate on runways with a 3.33" flange. This center drive crane is offered in capacities of 1 through 10 tons, with spans up to 60 feet. Also available is the model 517T which is offered in capacities of 3 through 15 tons with spans up to 60 feet. The 517T crane also operates on TrojanTrack® runways with 3.33" flange. Acco Louden Model 510 and 510T motor propelled dual drive and center drive truss cranes. The Louden® series 510 crane is a single girder, motor propelled center drive truss crane consisting of two truss members with a single girder bridge suspended between. This model is available in capacities of 3 through 10 tons with spans up to 100 feet. It is also available in model 510T using TrojanTrack girder bridge beam, and offers capacities of 5 through 20 tons, with spans up to 100 feet, to operate on TrojanTrack® runways. The truss cranes are also available in double girder. The Acco Louden product range includes a full line of crane components, including steel wheel drive end trucks 5,000 pound to 20,000 pound capacity, crane control kits, bridge girders, etc., are available. Manual and motor operated latches, spur track supports, and transfer sections are available for added flexibility of interlocking cranes to cranes or cranes to spur tracks. Please contact Met-Con today for a quotation on your Acco Louden lifting, crane and special material handling requirements.